Rowland Smith was born on April 18, 1938, in Southampton, New York. He was commissioned a 2d Lt in the U.S. Air Force through the Air Force ROTC program at Ohio State University on April 19, 1962, and completed Undergraduate Pilot Training and was awarded his pilot wings at Webb AFB, Texas, on May 9, 1963. Lt Smith next completed F-100 Super Sabre Combat Crew Training at Luke AFB, Arizona, before serving as an F-100 pilot with the 9th Tactical Fighter Squadron at Spangdahlem AB, West Germany, from March 1964 to April 1967. He then attended F-105F Thunderchief Wild Weasel Training at Nellis AFB, Nevada, from April to June 1967, followed by service as an F-105F pilot with the 13th Tactical Fighter Squadron at Korat Royal Thai AFB, Thailand, from June to October 1967, and then with the 44th Tactical Fighter Squadron at Korat from October 1967 to January 1968. Capt Smith's next assignment was as an F-105 instructor pilot with the 562nd Tactical Fighter Squadron at McConnell AFB, Kansas, from January 1968 until he left active duty and entered the Air Force Reserve on December 16, 1968. He joined the Iowa Air National Guard on July 31, 1969, and served as an F-100 pilot with the 185th Tactical Fighter Group at Sioux City ANGB, Iowa, from July 1969 to August 1972, followed by service as an F-105 pilot with the 127th Tactical Fighter Squadron of the Kansas Air National Guard at McConnell AFB, Kansas, from August 1972 to May 1973, having transferred to the Kansas Air National Guard on August 14, 1972. His next assignment was as an F-105 and then F-4 Phantom II pilot, as Deputy Commander for Operations, Director of Operations, Vice Commander, and finally as Commander of the 184th Tactical Fighter Group at McConnell AFB from May 1973 to May 1986. 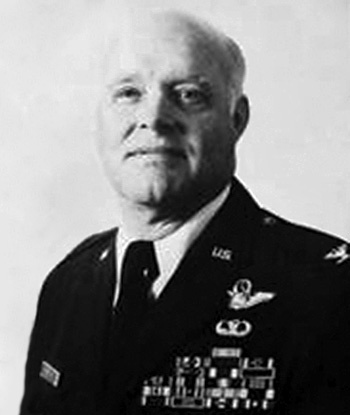 Col Smith served as Chief of Staff of the Kansas Air National Guard at Topeka, Kansas, from May 1986 to November 1989, and then as an Air Operations Staff Officer with the Kansas Air National Guard from November 1989 to July 1990. His final assignment was as Assistant Adjutant General for Air with the Kansas Air National Guard at Topeka from July 1990 until his retirement on February 1, 1992. Rowland Smith died on June 13, 2001, and was buried at Arlington National Cemetery. The President of the United States of America, authorized by Title 10, Section 8742, United States Code, takes pleasure in presenting the Air Force Cross to Captain Rowland F. Smith, Jr., United States Air Force, for extraordinary heroism in military operations against an opposing armed force as a Pilot leading a flight of F-105 Thunderchiefs of the 44th Tactical Fighter Squadron, Korat Royal Thai Air Base, Thailand, attacking a vital military target in the vicinity of Hanoi, North Vietnam, on 27 October 1967. On that date, with his aircraft hit and burning, Captain Smith exhibited the highest order of courage as he continued to fly through intense and accurate anti-aircraft fire to attack and destroy a hostile surface-to-air missile complex that was threatening a large F-105 strike force. With his aircraft still in flames, he remained in the target area while initiating rescue efforts for his downed wingman. Captain Smith then flew his crippled aircraft 300 miles to a skillful emergency landing. Through his extraordinary heroism, superb airmanship, and aggressiveness in the face of hostile forces, Captain Smith reflected the highest credit upon himself and the United States Air Force.